7 Kids and Us: NHV Natural Pet Products Plus GIVEAWAY! In the same way that I like to give my kids natural products, I love to use them on my pets. Why use something synthetic if natural is just as effective? I recently discovered the line of NHV Natural Pet Products and I am in love! NHV NATURAL PET PRODUCTS provides veterinarian-formulated herbal supplements derived from organically grown or ethically wild crafted herbs to support the health and well-being of pets including dogs, cats and other small animals. All supplements are manufactured at a state-of-the-art GMP and FDA certified facility. NHV also offers vet consultations to provide professional support and guidance for disease prevention and integrative treatment of any condition. For more tips, visit www.nhvnaturalpetproucts.com. 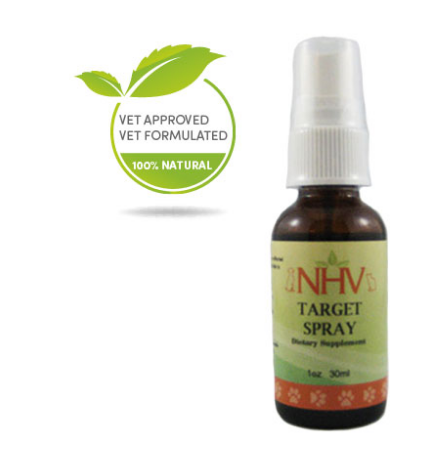 I chose to try the NHV Target Spray for dogs, which repels fleas and ticks, as well as lice and mosquitoes! I have had a hard time in the Florida heat with my little dog getting bit by fleas. We use the monthly flea control but it just doesn't work towards the end of the month. I love that when I see her itching I can spray some on her, and it really seems to help! You can check out all the NHV products here! Giveaway....enter below to be one of TWO winners to win a NVH Target Spray for Dogs!